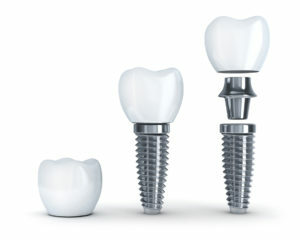 Dental Implants in Collierville Can Be Easily Placed! Have missing teeth? Have you experimented with a different tooth replacement option like partial dentures? If those aren’t providing you the results you truly want, you should consider highly successful dental implant placement! In fact, you could have a long-lasting, permanent replacement with a high success rate of at least 95%! Learn more about dental implants in Collierville in this week’s blog post. Your dentist makes sure that you’re the perfect candidate for dental implants before moving forward with the actual placement. During your very first appointment, your dentist will evaluate the health of your mouth and jawbone. Your jawbone needs to be stabilized enough to hold your implant posts in place. If your jawbone holds adequate strength, then we can move straight to the second step. If your jaw bone isn’t strong enough, your dentist can discuss some other options for you to build the strength up again, like a bone grafting procedure. If you are able to move forward to step two, your dentist will methodically develop a plan to place your implant posts within your jaw. Sometimes your dentist can do this themselves, other times they may refer you to a trusted oral surgeon. With the help of sedation dentistry, doctor-prescribed pain medication, and local anesthetics, you can be confident that the placement portion will be relatively painless. Then, you’ll go through a healing process called osseointegration, where the implant post fuses with your body. Finally, you’ll proceed to the last step of the process. The actual visual tooth replacement! You will finally be able to see the long-anticipated results! An abutment will be attached to your implant, following your prosthetic that fits your level of tooth loss. There are a multitude of reasons that play a part in your dental implant success. Your dentist will make sure you know how to take care of your mouth while healing, one of the most crucial periods to guarantee your dental implant success. Brush and floss all surrounding teeth within your mouth. Be sure to keep your mouth clean, especially when healing to avoid infections. Avoid all tobacco products as they can slow down your healing process. Don’t hold back any questions or concerns from your dentist, especially while your mouth is healing. If you’re committed to better oral health, dental implants are probably the best option for you. Here at the office of Joshua Holcomb, DDS, we believe that everyone deserves to have a healthy, functioning smile. We offer comprehensive dental services that include everything you need to restore your smile’s beauty and balance, including replacement teeth to restore stability. If you have any questions, feel free to call our office. Comments Off on Dental Implants in Collierville Can Be Easily Placed!